Shu Qi (舒淇) is showing signs that she may be pregnant. Halting all work since December, Shu Qi announced the reason she was resting was due to a skin rash outbreak. But fans suspected that there might be more behind the story. In photos that circulated on social media, Shu Qi appeared to have a noticeable belly bulge. Attending a company-related event, Shu Qi was dressed in loose jeans and a striped sweater, which bulged as she leaned forward. 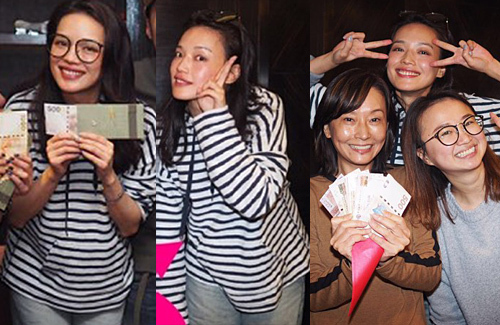 In the other photos, Shu Qi stood behind her friends, as if wanting to block her waist from the camera. In addition, Shu Qi’s face appeared to be slightly bloated as she gained weight during her hiatus. On her Weibo, she has also shown cravings for ice cream and pancake snacks. Showing signs that she may be expecting, perhaps Shu Qi and husband Stephen Fung (馮德倫) will have good news to announce very soon. 4 comments to Shu Qi Shows Belly Bulge Under Sweater; Is She Pregnant? The pappos are late. We all know that Shu Qi is pregnant. When she was ranting on Weibo when everyone thought she was having martial problems, she was having pregnancy mood swings. Also some women break out in a rash when they are tired, stressed and,/or pregnant. Shu Qi was going through it all. @bubbletea You’re very sharp-eyed! At first, I thought Shu Qi was only resting because of her skin rash. But the timing sounds right and I’ll be very happy when she and Stephen Fung announce their good news. @jayne I’ll be happy too. Even if she did not have the belly-bulge, her face is absolutely glowing and her lips are heavier too. There is definitely a Fung in her oven. All the moms here know what I am talking about. Shui Qi and Steven do make a lovely couple. Is she really pregnant? Oh wow, that would be great news. I am sure she wants to start a family otherwise why ‘get married’ since she had been living with Fung before that. Time to catch up with bestie, Ruby and the the kids can be besties too! Waiting for the official news.